Team Artworld presented their plan to bring art from the streets to the world. 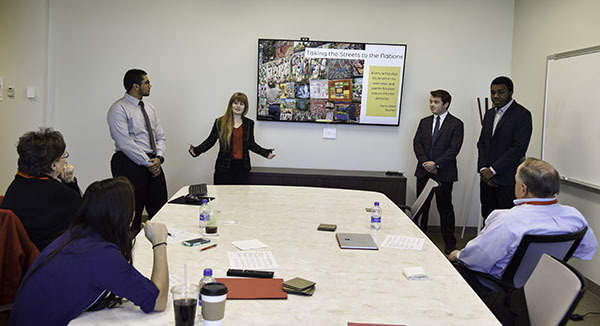 Competing for a chance at $1 million but more importantly the desire to create a positive impact on the world, students at the University of Nebraska–Lincoln pitched their business plans at the Nebraska Hult Prize Challenge November 16. Hosted in Howard L. Hawks Hall, the annual international competition challenged young people around the world to solve youth unemployment, asking them to create a business plan with the potential to provide meaningful work for 10,000 youth within the next decade. More than 100 students, in teams of three to four members, took the challenge and pitched their plans in the first round of the global contest, showing how they could make an impact with the prize money. Partnering with the Center for Entrepreneurship and the Husker International Business Club, Gloria Mwiseneza, a junior integrated science major from Kigali, Rwanda, was able to bring the competition to Nebraska for the first time. With assistance from a committee she put together, Mwiseneza served as the university’s Hult Prize campus director, coordinating the event. She knew with the spirit of support at the university, Nebraska would serve as a great place to host one of the Hult Prize’s campus competitions. Winning team Uhusiano pose with Gloria Mwiseneza (second from left). No stranger to pitching a business plan in competitions such as this, Lizz Whitacre, ’18, CEO of Pawlytics, served as a judge for the challenge. A former competitor and winner of the Center for Entrepreneurship’s contests such as 3-2-1 Quick Pitch and New Venture Competition, she brought a unique perspective – providing relatable feedback students could use. A local entrepreneur with her startup Pawlytics, a data management software for animal welfare organizations that can assist in saving the lives of companion animals, Whitacre left impressed by the level of global impact each of the business plans presented would have. Alexis Hakizimana presents her plan on a more efficient way to provide clothing to impoverished areas of Rwanda. With their ambitious goal and a feasible plan ready to implement, team Uhusiano impressed the judges, winning first place. The idea originated after Cheyenne Gerlach, a junior integrated science major from DeWitt, Nebraska, spent a summer living in Mbita, Kenya. After talking with more than 100 local farmers and community members, she saw an opportunity to make a difference. She asked Matthew Brugger, a senior applied science major from Albion, Nebraska, and Eli Wolfe, a sophomore agribusiness major from Kearney, Nebraska, to help found Uhusiano, which is Swahili for connection, and set out to change how aid money is distributed in countries the U.S. provides relief by using a data-driven, human-based design. Winning their campus-qualifying round, Uhusiano bypassed the normal application process to enter regionals, and will compete in Boston at one of 25 regional finals in the spring. They will take the next step in competition, ultimately leading to presenting at the United Nations and the $1 million prize. First Runner-Up – Artworld, an incubator that allows talented artisans from all over the world to sell their arts. Second Runner-Up – PROgress, a company partnering with employers to give youth the opportunity to develop professional skills through a pathway program while being compensated.